In harsh, unforgiving ocean waters, there are predators and there are prey. And in Assassin’s Creed IV: Black Flag, Ubisoft wants you to know you’re not at the top of the food chain. Much like Assassin’s Creed III, Black Flag features an ecosystem filled with all sorts of critters and creatures for protagonist Edward Kenway to hunt. Among those is the fiercest beast of the seven seas, the Great White Shark. While above the sea, the beast can be hunted just like any other…but once Kenway goes underwater, it’s an entirely different story. In an interview with Examiner, Black Flag director Ashraf Ismail confirmed that players won’t be able to kill sharks while underwater in the game. Once Kenway gets beneath the waves, however, the tables turn. There are environmental elements you can use in your fight, Ismail says, but the primary objective is survival. Kenway can drive the beast away, but he can’t kill them so long as he’s submerged. Assassin’s Creed IV: Black Flag releases on Oct. 29 for PlayStation 3, Wii U and Xbox 360, followed by a Nov. 15 PlayStation 4 release, Nov. 19 for PC and Nov. 22 for Xbox One. 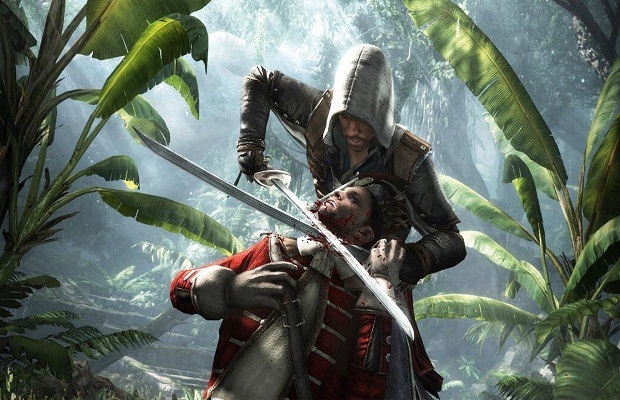 How does this new info factor into your shark-poaching plans for Assassin’s Creed IV: Black Flag? Let us know in the comments.